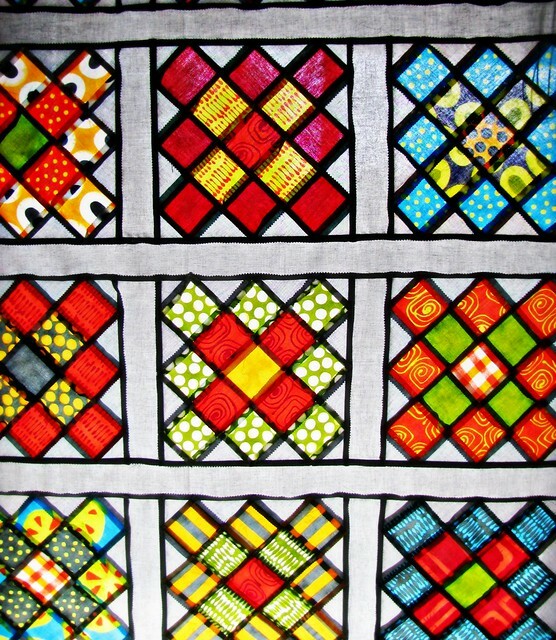 Granny square quilts are popping up everywhere! 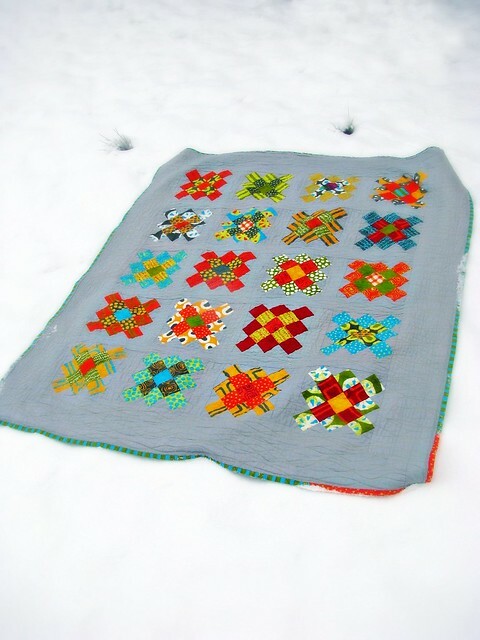 I loved Jolene’s granny square quilt tutorial at Blue Elephant Stitches as soon as I saw it. This design is meant to be great for using up scraps, but since it’s based on 2.5″ squares, it works really well with a jelly roll and charm squares. I used a Moda jelly roll in Silver and two charm square packs of Malka Dubrawsky’s new fabric line A Stitch in Color. 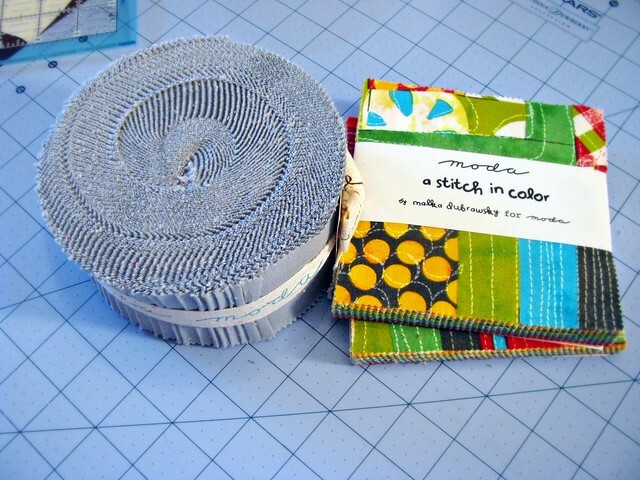 Jelly rolls are strips of fabric 2.5″ wide and as long as the fabric, so cutting 2.5″ squares was especially easy. The charm packs are 5″ squares, so they just needed to be cut in quarters. This saves a LOT of cutting time, lets you get right to sewing AND if you’ve fallen in love with a beautiful line of fabrics, it’s a great way to use them all together! Since the finished blocks are trimmed up and used on a diagonal, you’ll end up with your fabric on the bias — it tends to not want to lie perfectly flat. 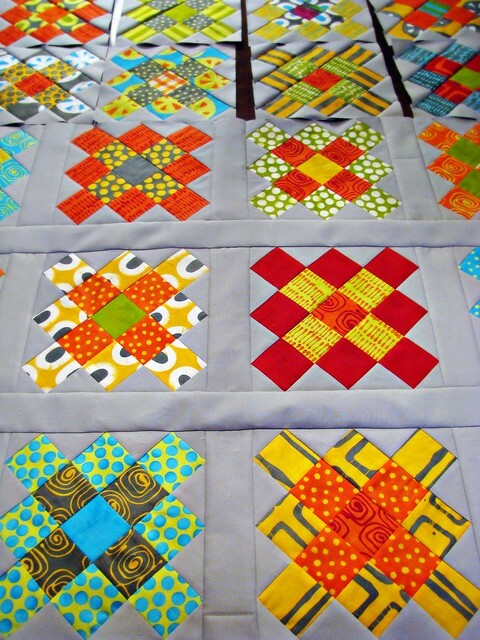 Don’t let this worry you, a good pressing before you sew the blocks together works wonders. And somehow I have to hold every quilt top up in front of a window. I seriously need to make quilt top curtains someday. The gray background makes the bright colors almost glow. 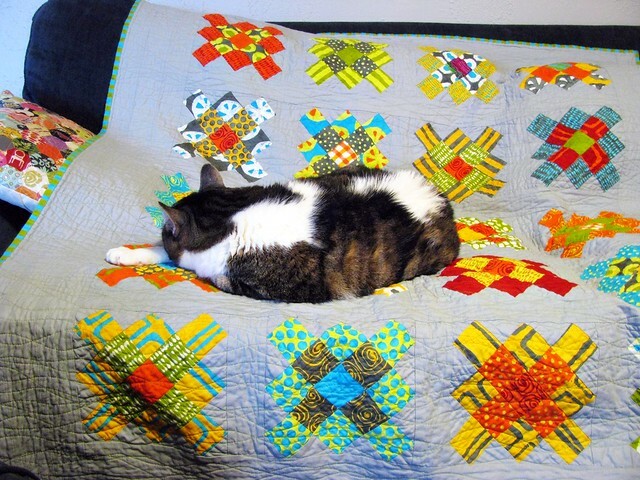 But be prepared to share, everyone will want your quilt! 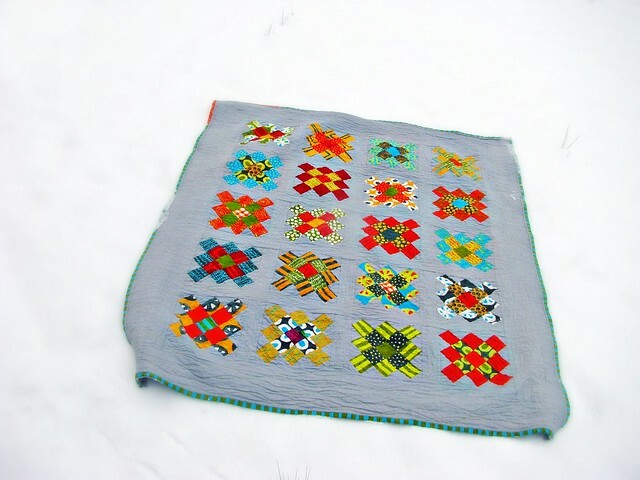 If you’d like to see more granny square quilts, check out the I <3 Granny and Scrap Attack Quilt-Along groups on Flickr. You’ll find loads of inspiration! The granny squares are really nice. Beautiful color combinations. Pingback: Six colour granny square tutorial?